Happy day after Valentine’s day – (AKA – as good a day to show your love as any other). My gift to you is a very easy vegan recipe for delicious Cheesy Pesto Kale Chips. 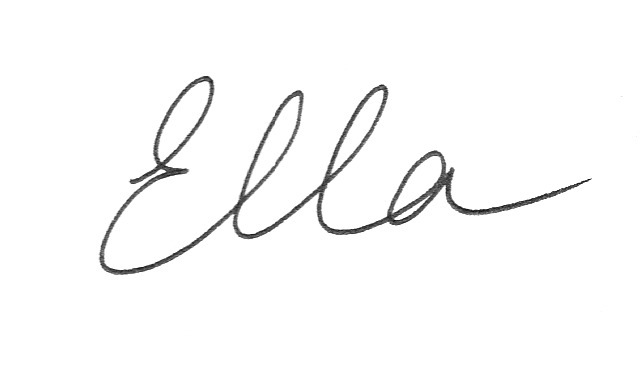 You’ll find it at the bottom of this newsletter. <3 To shake things up, I’m teaching a new class tomorrow that combines movement and healthy eating called One Healthy Mofo. Check that out here. I know that when I taste a homemade meal, made by someone who wants cares about me, it tastes very different than does a meal thrown together by a rushed worker at a deli. Don’t you? 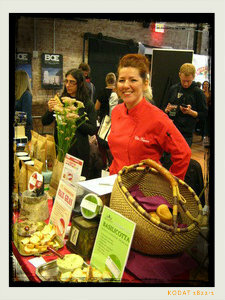 When I started Regal Vegan in 2007, I began with a mission: to make food that honored the eater. By that I mean, to be concerned for their well-being. As a certified holistic health coach, I knew the importance of getting your fiber, that walnuts provide loads of omega3s, and that soy was dangerous territory (over 90% of the soy in this country is genetically modified). So I used only organic, traditionally-made miso and organic, gluten-free tamari to flavor my lentil walnut pate. I made sure the product was all natural, contained no genetically modified ingredients, remained gluten-free and had a healthy dose of beneficial nutrients. And no artificial ingredients. I wanted it to be so delicious that you would want to eat it regularly, and that after you finished, the positive effects of its ingredients could continue to give you energy, protein and nourishment. If that isn’t love, I don’t know what is. 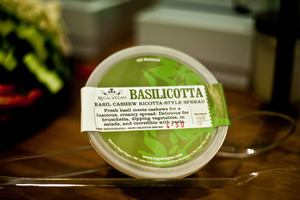 Basilicotta is also made with love, respect and other nutrients, of course. What many enjoy as a cashew cheese dip, a sandwich spread, a sauce, and a creamy herbed-cheese substitute – is made entirely without the dairy. That’s where the respect comes in – for the animals and for our one, precious planet. And nutrients, of course: we know that cashews are rich in iron, phosphorus, selenium, magnesium and zinc not to mention phytochemicals, antioxidants and protein. They have the same monounsaturated fat found in olive oil. Basil has some pretty incredible properties as well: it’s anti-inflammatory, anti-bacterial, is loaded with beta-carotene, magnesium and anti-oxidants. You’re welcome. I love you. I’m developing new products with the same tenets in mind. Please stay tuned – we’ll have some at the Vegetarian Food Festival this March 2nd and 3rd. I’ve also got a gourmet vegan recipe in Linda Long’s new book Virgin Vegan for which we’ll be doing an event at the James Beard Foundation on March 6th. You’re invited! Want to share the love with some friends in other places? WE SHIP. I hope to see you all soon at one or all of our upcoming classes, events and tastings. Please fan Regal Vegan on facebook and follow us on twitter and tumblr. We appreciate your support and wish you a joyful, love-filled month. I would like to extend a warm (but not sweaty) welcome to all our new fans, friends and followers that we’ve met at the IACP show (International Association of Culinary Professionals), the Seed Vegan Experience, Vegetarian Food Festival and Vegan Shop Ups, the Flea and cooking classes throughout the year. Come by and say hi again every Saturday @ the Brooklyn Flea on Lafayette. We’ve got fresh tubs of our Faux Gras, and brand new cashew cheese spread Basilicotta – but also delicious new easy vegan recipes like this week’s Raw Zucchini Noodles with Basilicotta Cream Sauce & Cherry Tomatoes. We’ve got class. Summer is in full swing and the markets are absolutely brimming with gorgeous produce. I find myself reaching into my kitchen skill set to cook less and enjoy food more. Want to know how? Join me in my don’t miss nutrition workshop this Tuesday at Skillshare’s headquarters in SoHo. I’ll be teaching a fun & incredibly useful class called “How to make a week of meals in a day”. A day? Actually 3 hours. You’ll walk out with 9 recipes, a full belly and the skills to make the meals – without a ton of work. And that includes a fantabulous dessert.Register here. Need one more reason? The first 3 people to use the code WERK814 will get 15% off the class! Yes, you can share the code. You’ll want to keep your sights on the next vegan cooking class too – A No-cook Indian Meal for a HAWT supper. I mean, it’s August right? So it’s hot but still – tis the season for local, fresh organic veggies. Join me for another fun class @Skillshare HQ for a spicy, delicious class where we won’t even turn on a single flame – but the food will be divine and Indian. Learn authentic Indian recipes I picked up while traveling in India and delight your palate. Register here. Oh Ship! 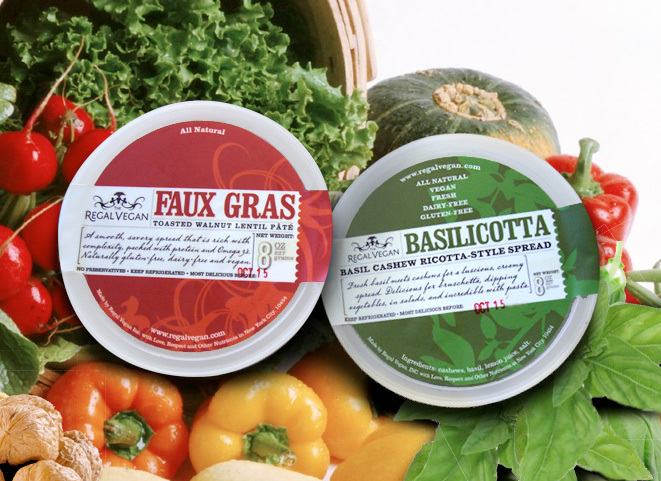 For all your friends that are outside the city limits, we’ve got a web store rocking so we can ship our Faux Gras & Basilicotta to loved ones near and far. Orders arrive in a temperature controlled cooler and can delight people as far away as California where they are outlawing Foie Gras (Hurray!). We hope to see you all soon at one of our vegan cooking classes, or any of our upcoming events. As always, please stay in touch with emails or comments on our facebook page. We value all of your feedback and thanks for reading along. Happy Eating!